I can search monmouth county, parts of Ocean county and maybe Middlesex. 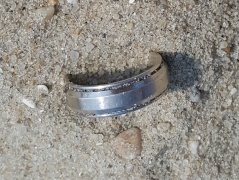 I work on a reward basis, that means you pay what its worth to you and what you can afford to have me find your lost ring. I've been detecting for 30 years now and have done a lot of returns in my day, glad to help people get back what they have lost. Dennis saved the day! How do you put a value on his service when the items he recovers are emotionally priceless? I asked to Mr. Burlingame how much for the invaluable help and his reply shocked me! I was ready to transfer funds in order to pay Dennis, but Dennis clearly does this solely to help people in need and pay forward good karma! Legit you saved the day man! I am still so very thankful for his service until this day and I promise to keep paying it forward as well, Dennis! 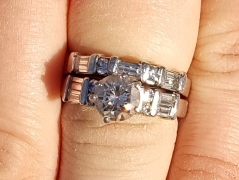 Dennis, thank you so much for finding my diamond engagement ring and wedding band! I promised my 3 year old (after seeing her puppy dog eyes) she could take 3 quick rides on her sled down a small hill on the corner of my block in the foot of snow we just got. I didn’t put my gloves on because I thought it would be easier to help her. Big mistake! As I helped her off the sled after the second ride, I felt both rings slip off my finger and disappear into the snow. I was devastated! I couldn’t find it anywhere. It was dark and the flashlights didn’t help. My husband and I looked for a while but it was super cold and I felt like I was calling attention to myself with the flashlight. I didn’t want someone else to see that and start looking for something after I left. My husband found Dennis online and he came out the next morning at 9am. Within 10 minutes with his metal detector, he found both rings! They were buried underneath the snow near where I was with my daughter. Dennis was very professional and I trusted him. I would recommend Dennis to anyone who lost a ring. Thank you Dennis!!! Very lucky to have found you!